Q: The BRICS Xiamen Summit is about to lift its curtain. We noticed that some participating leaders have expressed their great expectations for it, and the media has made some positive remarks. What is your comment? 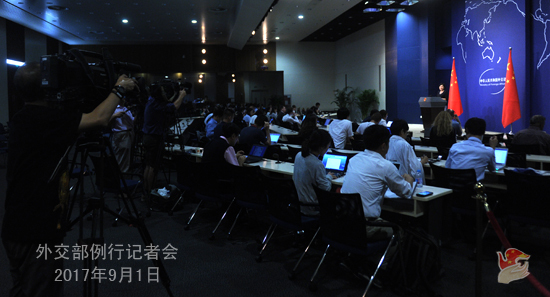 A: The BRICS Xiamen Summit will open on Sunday. As you said, many foreign leaders who will soon join us in China have expressed their expectations for the upcoming Summit. We noticed that today's edition of the People's Daily published an article written by Russian President Putin in which President Putin said that the BRICS cooperation is founded on the basis of equality and mutual respect, and Russia attaches high importance to the constructive cooperation among the five members of BRICS, and he believes that the Xiamen Summit will elevate coordination among the BRICS countries to a whole new level. Brazilian President Temer also said in an interview with the Chinese press that he has full confidence that the Xiamen Summit will be a great success and the BRICS mechanism will bring development opportunities to people in all the BRICS member states. We speak highly of President Putin and President Temer expressing their support and trust for China's hosting of the Summit. After ten years of development, the BRICS countries have become key forces for driving world economic growth, promoting transformation of the global order, and maintaining international peace and stability. This year, as the BRICS cooperation marches into the second decade, is an important juncture for us to build on the past and achieve more. Against the background of profound changes in the international landscape, the BRICS countries, as representatives of emerging markets and developing countries, are responsible for and capable of playing a more positive and constructive role in addressing global challenges. As the BRICS rotating chair, China stands ready to work with other BRICS members to expand, consolidate, and strengthen the BRICS cooperation so that together we could generate greater synergy, speak in a stronger voice, build a more solid social foundation, forge a wider partnership, and form a more effective institutional structure. All these will lay a more sound foundation for deepening the BRICS partnership and initiating the second golden era of the BRICS cooperation. We believe that with the concerted efforts of all sides, the BRICS Xiamen Summit will be a great success and elevate the BRICS cooperation to a higher level. Q: Foreign Minister Wang Yi talked about the concept of the BRICS Plus the day before yesterday. Egyptian media recently reported that President al-Sisi's attendance at the Dialogue of Emerging Markets and Developing Countries will help the world better understand Egypt and grow Egypt's economy. Does this mean that the concept of the BRICS Plus is winning more and more support from countries around the world? A: Foreign Minister Wang Yi gave a detailed introduction to the relevant arrangements, topics and expected outcomes of the Xiamen Summit at the press briefing on August 30. He elaborated in great length about the BRICS Plus cooperation model when answering a question from the journalists. As representatives of emerging markets and developing countries, the BRICS members have been conducting dialogues and cooperation with other emerging markets and developing countries. Since 2013, the chair of the BRICS Summit has been inviting non-BRICS countries to engage in dialogues and communications with the BRICS countries. This year, China crystallized the successful experience of the past few years and proposed the BRICS Plus cooperation model so as to forge broader partnership. The concept of the BRICS Plus embodies openness, tolerance, and win-win cooperation, which is in alignment of the BRICS spirit and conducive to releasing the vitality and enhancing the influence of the BRICS cooperation as well as injecting stronger impetus to the world economic growth and promoting common development. Just like you said, the BRICS Plus model has been gathering more positive response and support from other emerging markets and developing countries since its inception. While preparing for the Xiamen Summit, China has been in close communication and coordination with other BRICS countries. We look forward to taking the Xiamen Summit as an opportunity to work with all sides, take stock of the past experience for cooperation, draw a blueprint for future development, and promote the BRICS cooperation to a higher level. Q: It is reported that Vietnam has expressed complaints to China regarding China's military drills around the mouth of the Beibu Bay. What is your reaction? 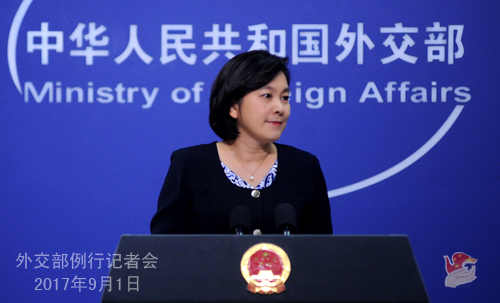 A: After checking with the relevant department, we have learned that a PLA unit is now conducting regular military trainings in waters northwest of the South China Sea in accordance with its annual training plan. The Maritime Safety Administration of the Hainan Province issued a navigation notice in advance as usual and in accordance with law. Relevant waters are under China's jurisdiction. On the basis of China's domestic law, international law and international common practice, China's military trainings in relevant waters are beyond dispute. We hope relevant parties could view it calmly and rationally. Q: The 22nd meeting of the Joint Working Group for the Implementation of the DOC was held in the Philippines. How did it go? A: On August 30, the 22nd meeting of the Joint Working Group for the Implementation of the DOC was held in Manila, the Philippines. The meeting was held to implement the second step of the three-step vision on the consultations of the COC raised by Foreign Minister Wang Yi at the recently-concluded Foreign Ministers'Meeting of China and ASEAN. In a harmonious and cordial atmosphere, all parties had a candid and thorough exchange of views on the implementation of the DOC, consultations on the COC, and maritime practical cooperation, set out principles, pathways, approaches and working mechanisms for the next-stage consultations on the COC, and formed related consensus documents. These marked a good start for consultations on the text of the COC. Before the meeting, experts and scholars also reached consensus on maritime practical cooperation at back-to-back theme-specific seminars. Q: Philippine President Duterte said in Manila that the 3-month fight against extremists in Marawi has reached the final stretch. What is your comment? A: Fighting terrorism is a common responsibility shared by all. China believes that the Philippine government is capable of ending its fight against terrorism in Marawi as soon as possible so that peaceful and tranquil life could be returned to the people in Marawi and Mindanao. We have said many times that we support the counter-terrorism efforts of the Philippine government and have offered a batch of emergency aids to its counter-terrorism fight in Marawi. China will continue with its support and assistance, including post-war settlement and reconstruction, as needed by the Philippine side. Q: The Director General of the International Atomic Energy Agency (IAEA)certified again in a report that Iran remains in compliance with the Joint Comprehensive Plan of Action (JCPOA). What is your comment ? A: China has noted the latest report submitted by the IAEA Director General which once again confirmed Iran's compliance with the JCPOA. 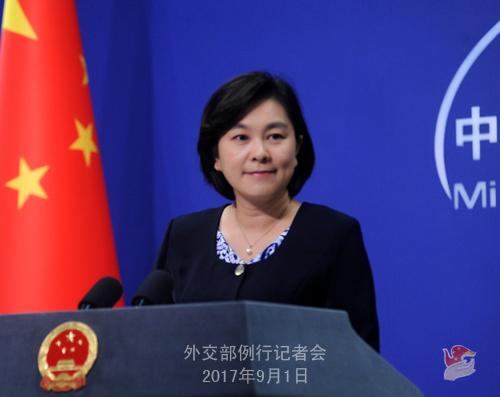 China welcomes that and commends the efforts made by Iran and the IAEA. We hope that all relevant parties could carry on with their implementation of the JCPOA and that the IAEA could continue honoring its obligations with an objective, unbiased and professional attitude.